I remember listening to DragonSlayer, Dream Evil's first release, like 7 or 8 months after it was actually released. I thought it would be another average power metal release with awesome musicians that would do nothing for metal. Man was I wrong. First, by thinking that Dream Evil was a power metal band instead of a true heavy metal band, and second by taking the DrangonSlayer as an average release. This brings us to The Book of Heavy Metal, the band's third offering, and here the band's statement could not be stronger: WE ARE A HEAVY METAL BAND WHO PLAYS METAL BY THE BOOK AND COULDN'T DO IT BETTER!!! As you imagine by now, The Book of Heavy Metal contains every imaginable heavy metal cliché. We have the high pitched vocals of Niklas Isfeldt, who does an amazing job in this one. The fast shredding solos courtesy of guitar hero Gus G and the thundering pummeling drums of Snowy Shaw, who once again proves that he is one of the best around. We also have the cheesy lyrics about being metal, making rock, staying true to ourselves and every single one Manowar has done already. 'The Book of Heavy Metal' is the opener and it takes you back to the mighty Accept days. The song is very catchy and very heavy. The next songs are 'Into the Moonlight' and 'The Sledge' that maintains the quality of the opener by making the listening quite interesting. Then comes what in my opinion is the heaviest and catchiest song on The Book of Heavy Metal, 'No Way.' This is the best song Dream Evil has ever written. The sixth song, 'Let's Make Rock,' reminded me of Twisted Sister's 'I Wanna Rock' anthem. In the chorus Niklas even sings the following, "Let's make rock, what are you waiting for?" This is another fun song that I can see working out great live. The rest of the songs are really good. 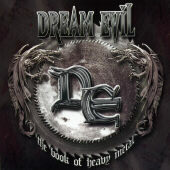 Dream Evil will be take you to the days when listening to metal was fun and had no compromises. Dream Evil certainly deliver.